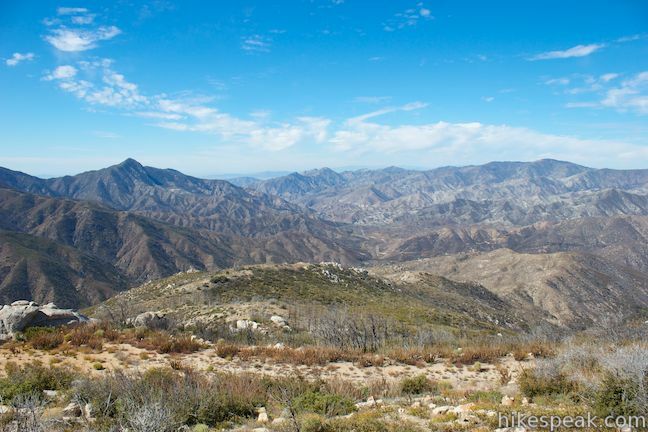 Vetter Mountain has got to be one of the more scenic peaks in the San Gabriel Mountains, boasting a 360-degree summit that’s a total stunner. 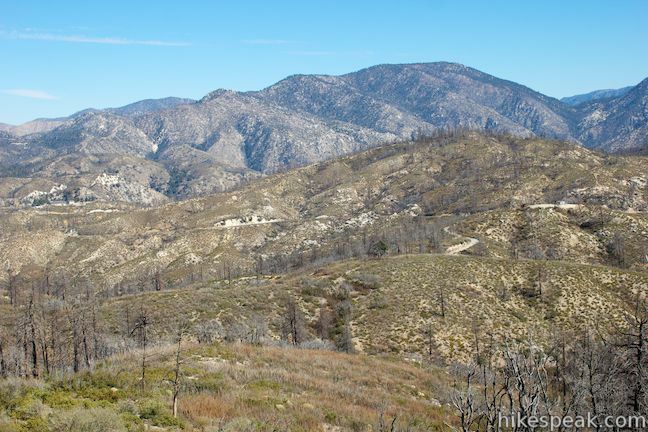 For decades, hikers marched up the mountain to see the historic fire lookout tower that stood at the summit, but in 2009, the Station Fire destroyed the tower and scorched Vetter Mountain. 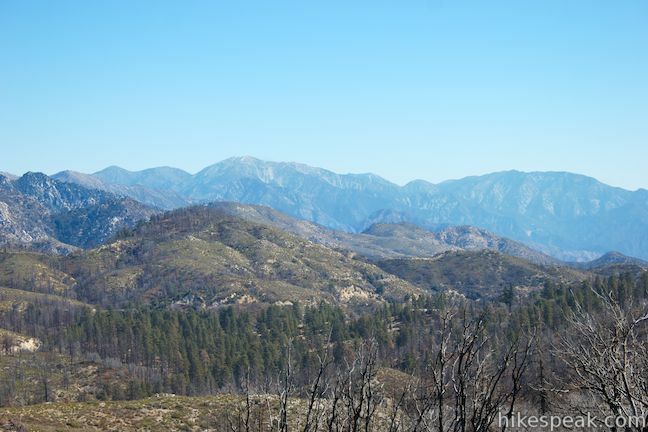 The area is still in recovery from the wildfire, but trails to the 5,908-foot summit are open, allowing hikers to enjoy spectacular views over the San Gabriels. 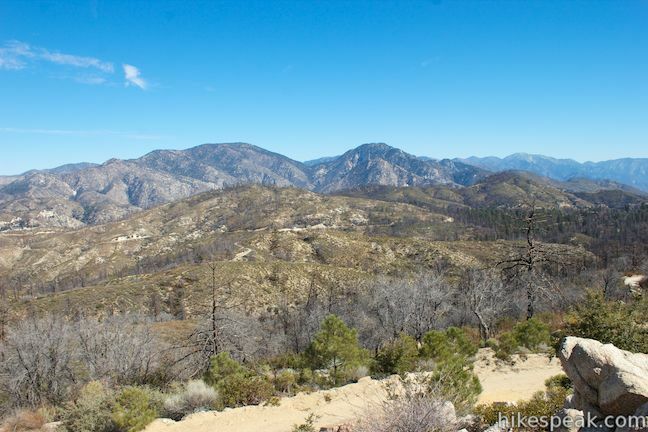 The most apparent option is to hike 1.9 miles up Vetter Mountain Road, a wide and mostly paved service road with 525 feet of elevation gain. 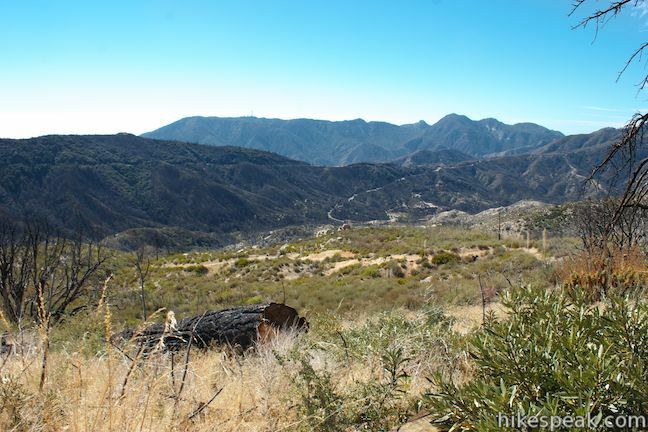 Another option is to hike a mile up Silver Moccasin Trail, a dirt single track that connects to Vetter Mountain Road to offer a 2.2-mile route to the top with 650 feet of elevation gain. 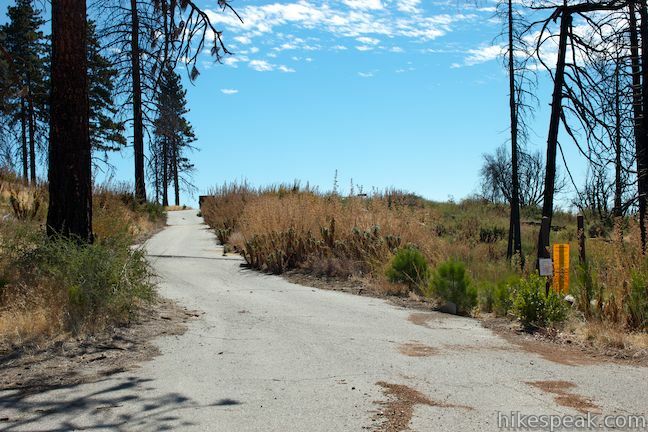 A third option, Vetter Mountain Trail, has become so overgrown by poodle-dog bush (which grows rampant after wildfires and can irritate your skin like poison oak) that it appeared to be impassable as of the fall of 2013 (but would otherwise provide a 1.4-mile route up Vetter Mountain). Poodle-dog bush lines parts of Silver Moccasin Trail and Vetter Mountain Road as well, so it is recommended that you hike in pants and long sleeves, and avoid touching the irritating bushes. 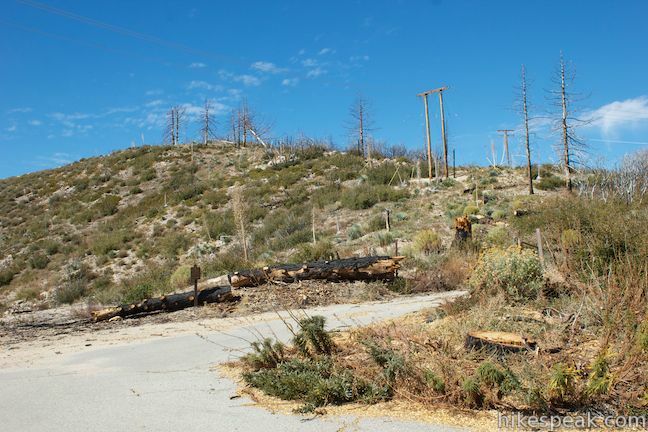 As Vetter Mountain continues to recover from the Station Fire, there should be less and less poodle-dog brush to deal with. Nevertheless, hike carefully so that you come back unscathed with nothing but great photos and good memories. 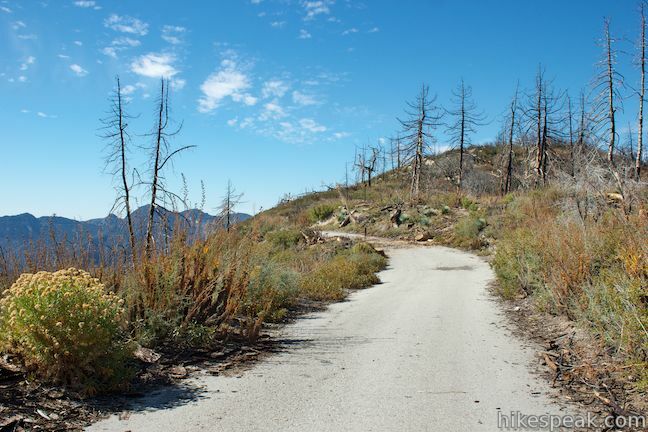 The most obvious route to Vetter Mountain is via the road that carries its name. 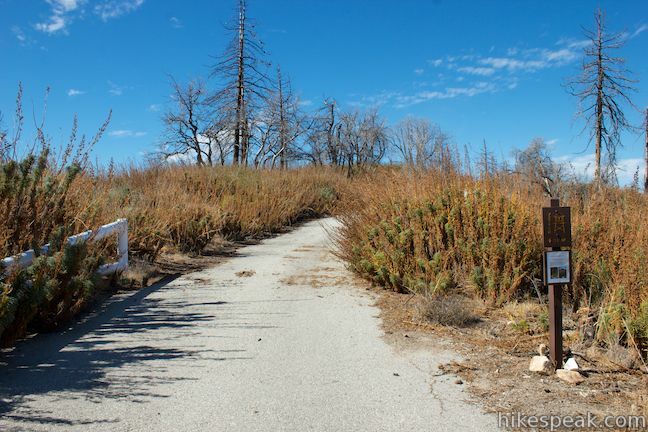 Once you turn into Charlton Flats Picnic Area from Angeles Crest Highway, you will reach an immediate split in the road. 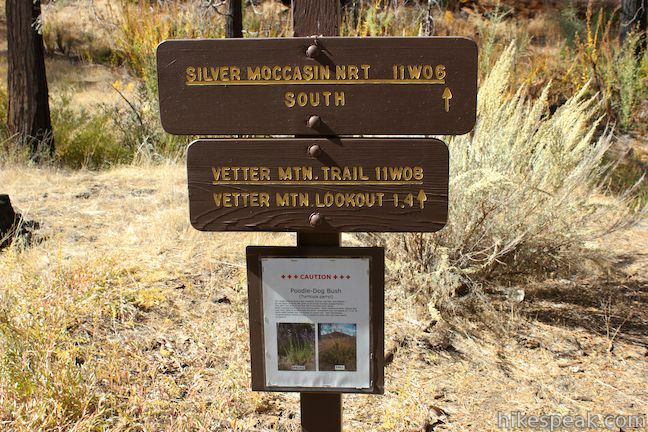 A sign for Vetter Mountain Lookout will draw you to the left. Proceed this way (Silver Moccasin Trail can be reached down the other road to the right) and you should soon arrive at a gate across the road. 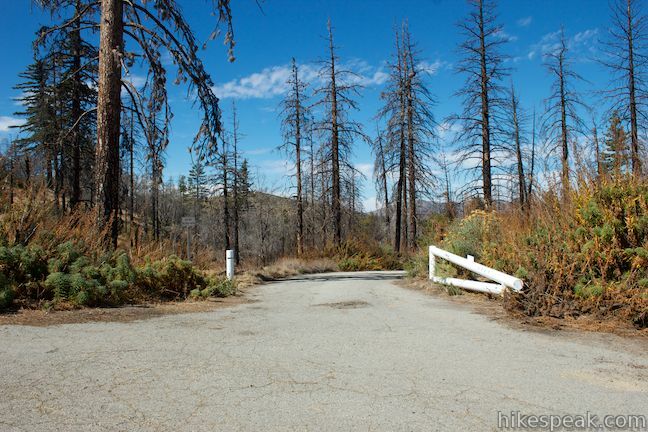 Park in the small lot on the right and begin hiking up Vetter Mountain Road, which is paved for the next 1.2 miles. Hike up Vetter Mountain Road through a forest of live oaks, Jeffrey pines, sugar pines, and other conifers. 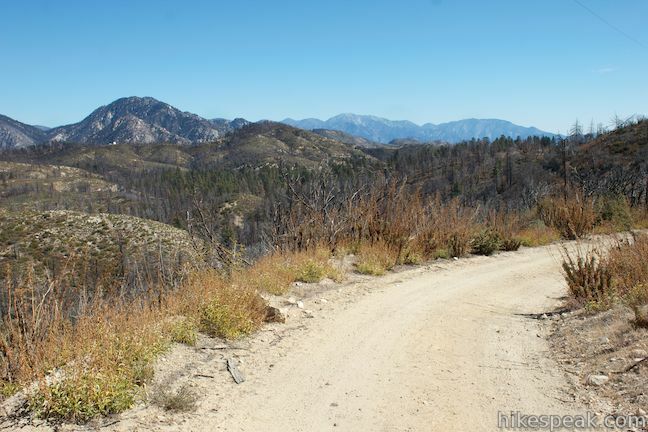 A quarter mile up the road you will come to an intersection with another paved road, Forest Service Road 3N16. Stay to the left up Vetter Mountain Road. 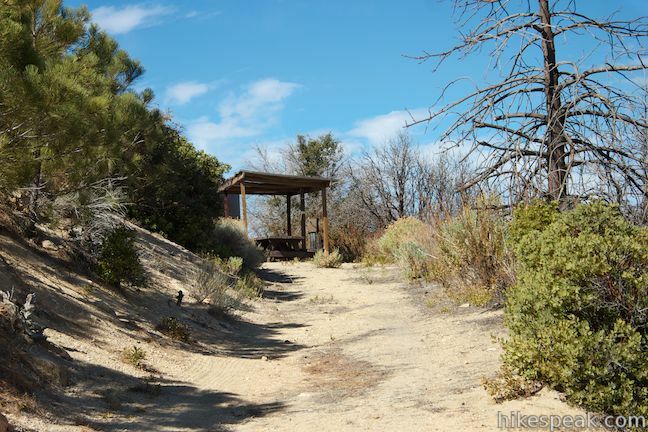 You will pass several bathrooms along the road next to picnic sites that were more popular and accessible prior to the Station Fire. 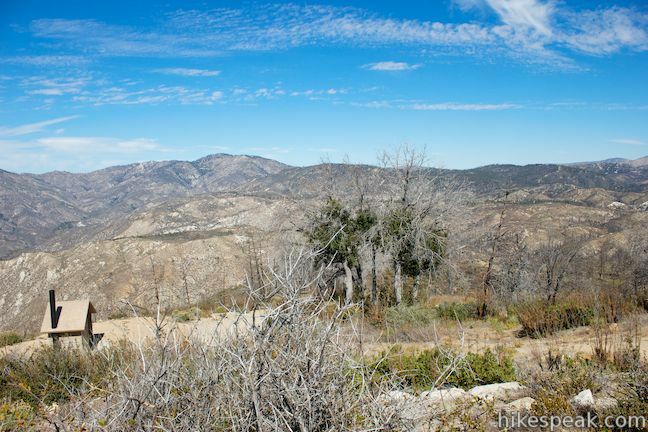 After hiking for 0.7 miles, you will reach the point where Silver Moccasin Trail crosses Vetter Mountain Road. 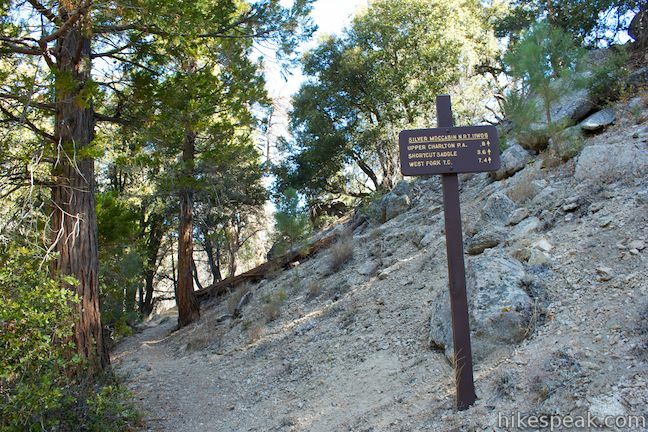 The trail crossing is next to picnic site 19 and a marker that shows the distance to the summit as 1.2 miles. 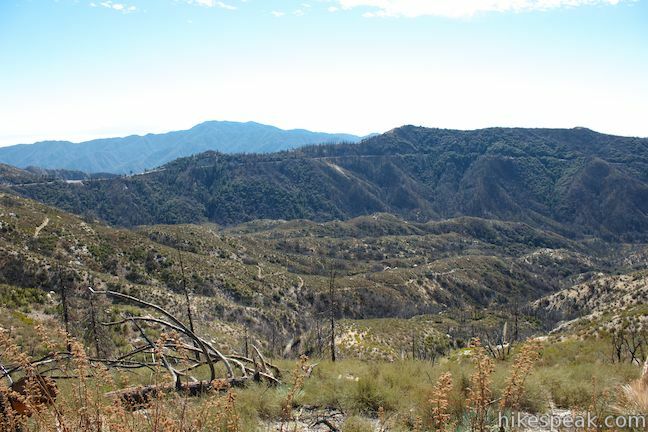 Continue up Vetter Mountain Road along a ridge toward the mountaintop, discovering views to your left over Upper Big Tajunga Canyon, a large trench bordering Vetter Mountain to the west. 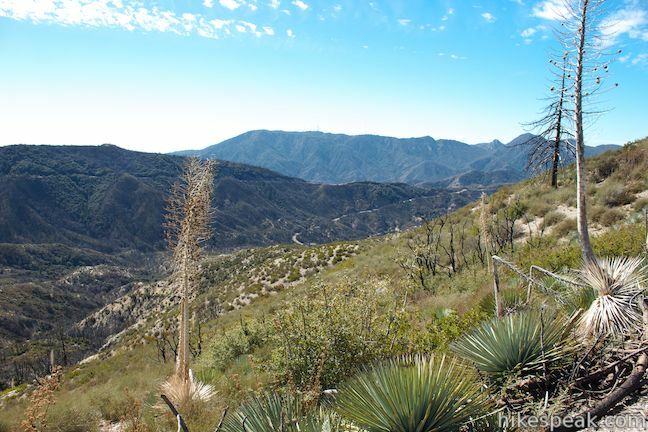 Beyond the ridge on the other side of the canyon you will spot Mount Wilson, which is topped by radio towers. 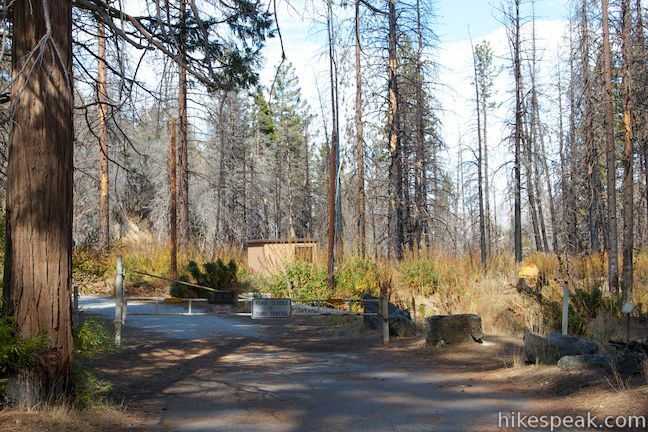 At 0.8 miles from the trailhead, you will pass another parking area along Vetter Mountain Road and a few more picnic tables. With tall poodle-dog bush framing the road on both sides, this is currently not somewhere that you would want to sit down for a snack. 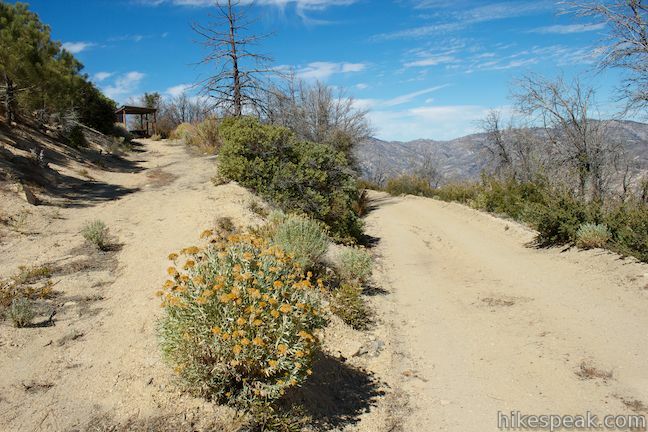 Proceed up the center of Vetter Mountain Road, which is plenty wide enough for you to avoid touching the poodle-dog bush. With 0.7 miles to go, you will pass through another junction. Stay to the left again, past a gated road that descends to the right. 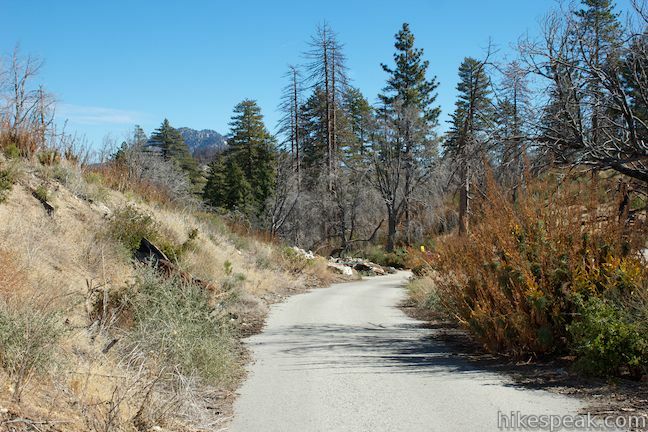 Beyond the junction, Vetter Mountain Road becomes unpaved, so you will have dirt and gravel to hike on for the duration. 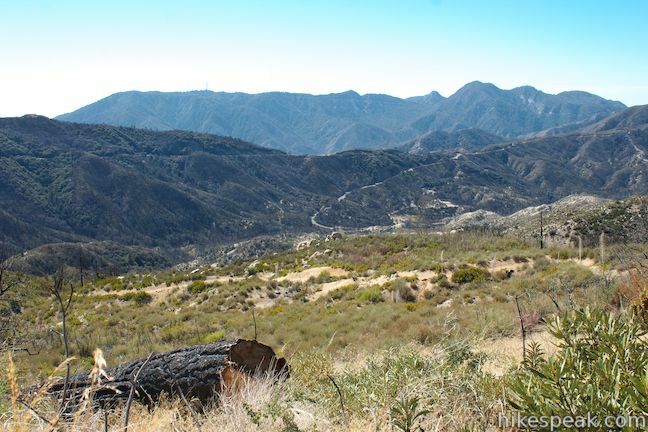 As you ascend the eastern slope of Vetter Mountain, there are views east toward Mount Waterman and Twin Peaks. 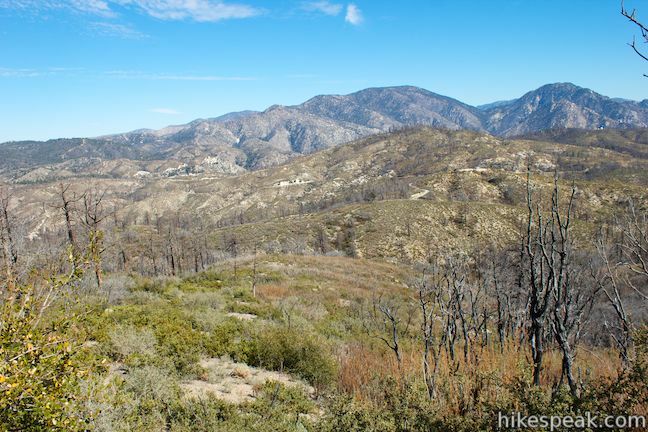 The trees thin as you get higher, replaced by chaparral like scrub oak that allow for broader views. 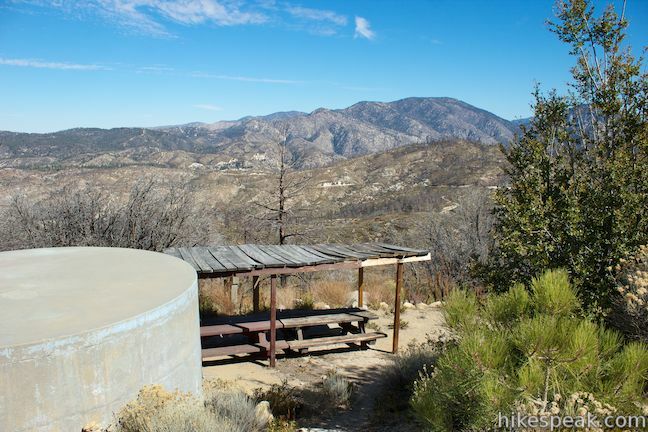 Just below the summit, Vetter Mountain Road passes what must be one of the must picturesque privies in all of the Angeles National Forest. 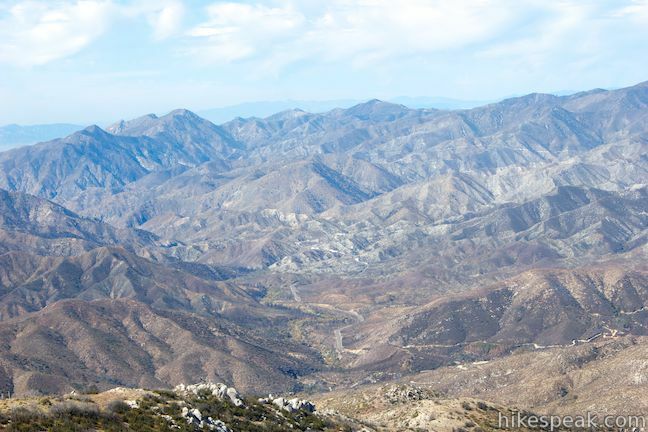 The backdrop for the vault toilet is an enormous view into Big Tajunga Canyon. 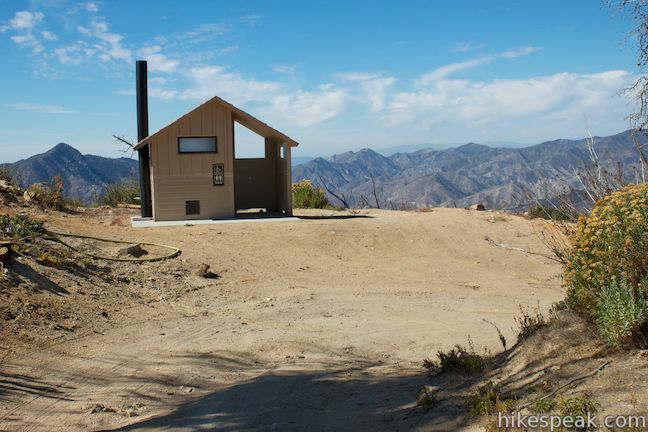 Keep hiking up the road for a bathroom-free view of the canyon and so much more. 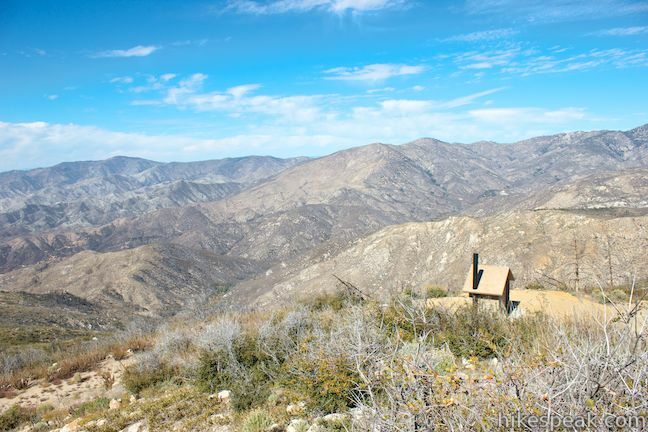 On the way to the top, you will pass a side trail to a picnic table and then make a right turn to climb to the end of the road, just below the summit. 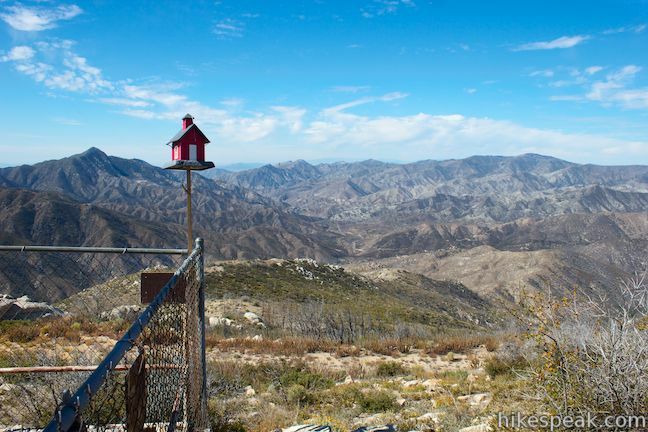 Straight ahead there is a pavilion built by the Angeles National Forest Fire Lookout Association as a temporary lookout point, complete with a pretty awesome birdhouse. 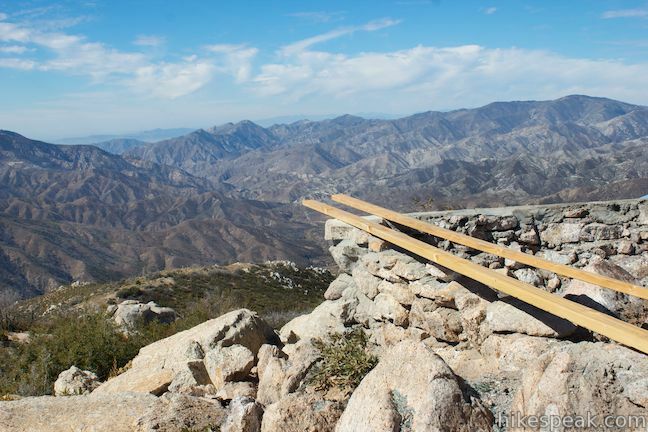 To the left, there is a staircase up to the summit where you will find the stone foundation of the old fire lookout tower, surrounded by piles of boulders and epic views on all sides. 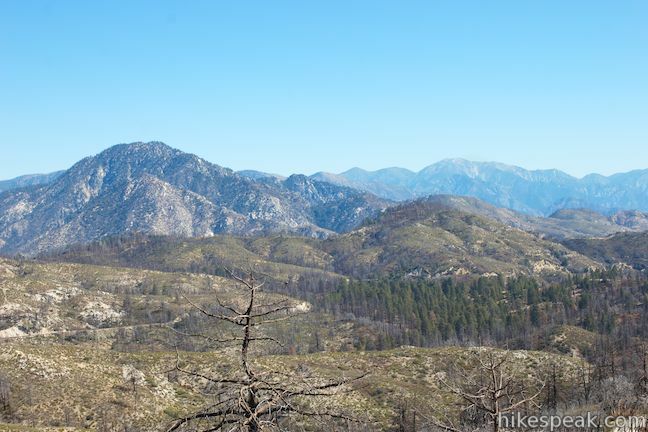 From Vetter Mountain you can look west across Upper Big Tajunga Canyon toward Strawberry Peak, or look north across the Alder Creek drainage toward Mount Pacifico and Mount Hillyer, or look northeast toward Mount Waterman and Twin Peaks. 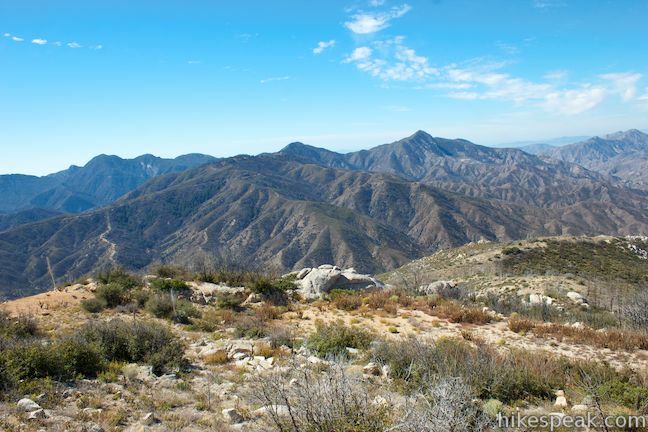 Beyond those peaks, directly east, is the iconic form of Mount Baldy. 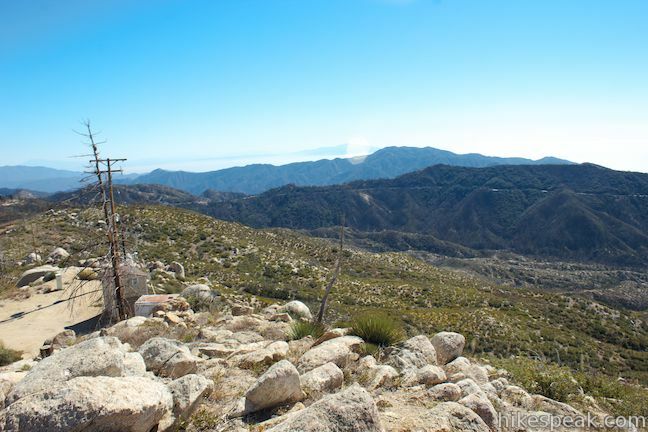 Cucamonga Peak rises to the southeast and the ridges framing the top of Upper Big Tajunga Canyon lie to the south. 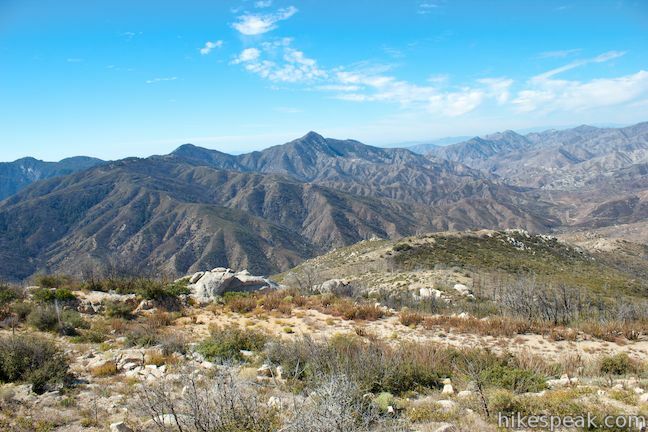 Beyond the canyon rises Monrovia Peak, and in the distance you can even make out Santiago Peak in the Santa Ana Mountains. 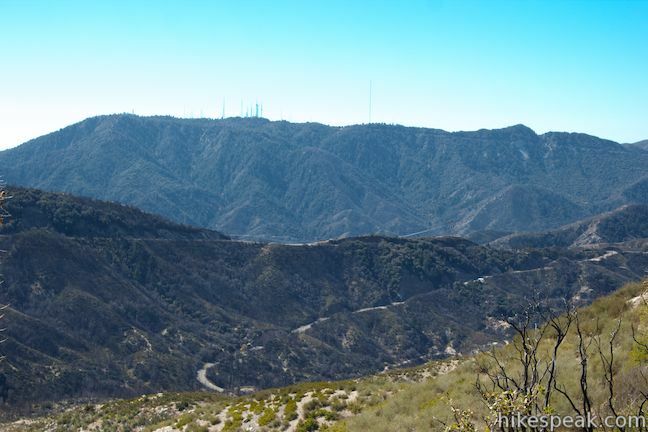 Mount Wilson, which is easy to identify with its long radio tower-covered ridge, looms large to the southwest, where you will also spot San Gabriel Peak to complete the summit 360. 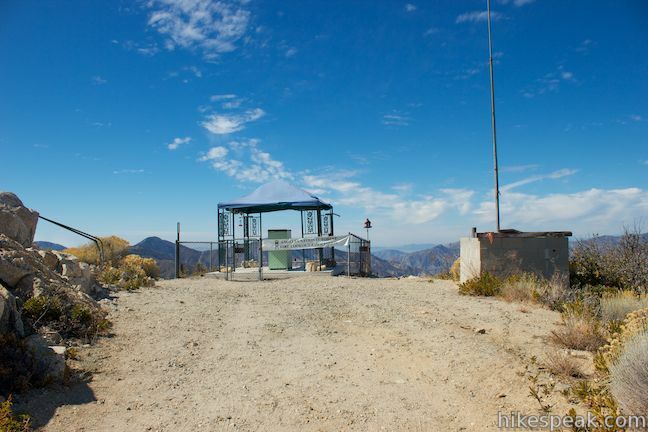 The fire lookout on Vetter Mountain was built in the 1930s, with each square wall measuring 14 feet long with tall windows. The lookout closed in 1981. 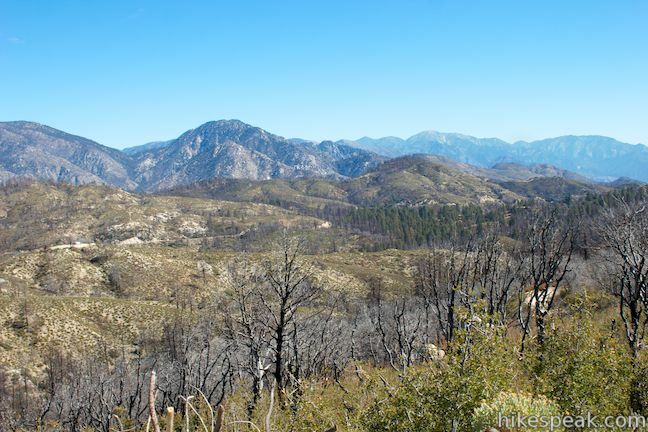 After that time it was restored and reopened in 1998 and staffed during the wildfire season each year until it was destroyed. 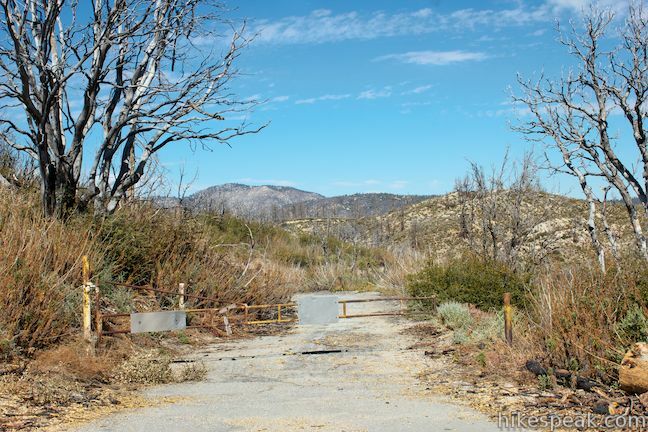 There appears to be an effort underway to restore the tower, but it still may be several years before a new lookout tower rises over Vetter Mountain. 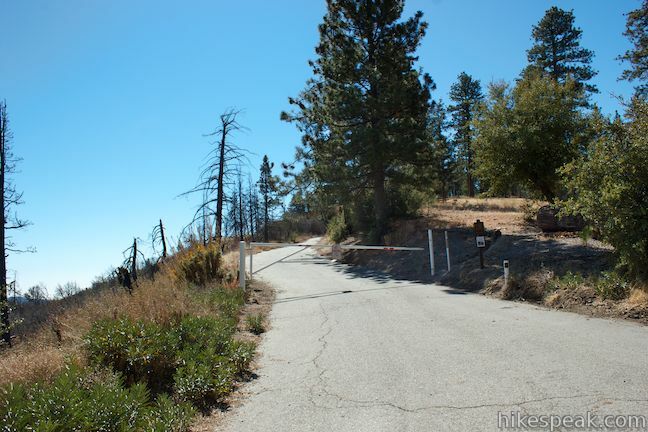 Instead of staying to the left after you turn into Charlton Flats Picnic Area, turn right at the intersection, away from the signs for Vetter Mountain Lookout, and drive down into the picnic area. After half a mile, just before a gate across the road, you will find a trail marker for Silver Moccasin Trail and Vetter Mountain Trail on the left. Park along the road where there is room (there aren’t any parking spaces right at trailhead) and begin hiking up the combined Silver Moccasin Trail – Vetter Mountain Trail). 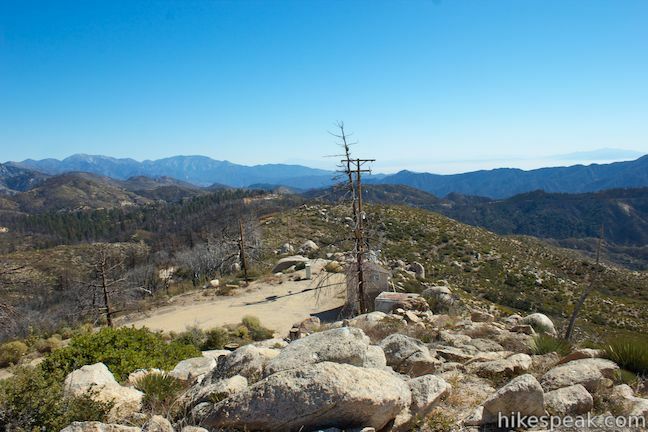 Silver Moccasin Trail is a 53-mile long route used by boy scouts and other backpackers to cross the San Gabriel Mountains between Chantry Flat near Mount Wilson and Vincent Gap near Mount Baden-Powell. 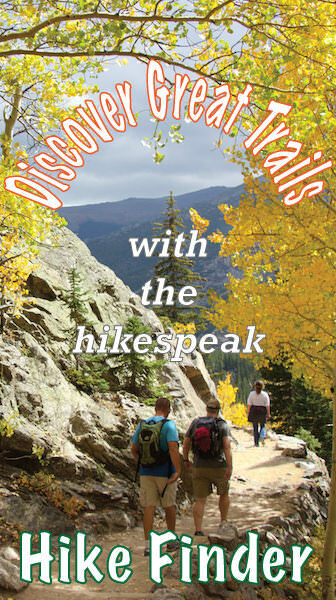 Don’t get frightened by that distance because you will only be hiking a one-mile stretch of the trail. Poodle-dog bush (Turricula parryi) can cause mild to severe skin irritation, itching, red rash, and blisters. Do not touch or smell this plant or its purple trumpet shaped flowers. 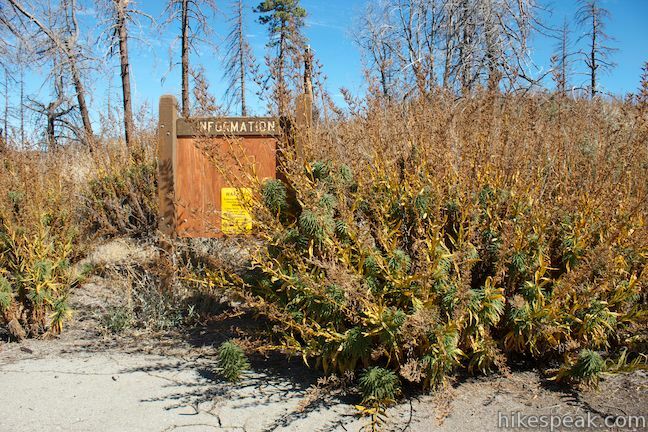 This plant can grow to ten feet tall in mountain burn areas. Wash exposed areas with cold running water. Wash clothing or other objects that may have come into contact with the plant. Symptoms may not appear for 12 to 36 hours after contact and are similar to poison oak. Wet compresses, nonprescription antihistamines, or calamine lotion also may help relieve symptoms. After a tenth of a mile on this dirt single track, you will come to a junction. Vetter Mountain Trail breaks off to the right and continues for 1.3 miles to the summit. Unfortunately, as of the fall of 2013, Vetter Mountain Trail becomes so overtake by poodle-dog bush that it is basically impassable after another tenth of a mile. 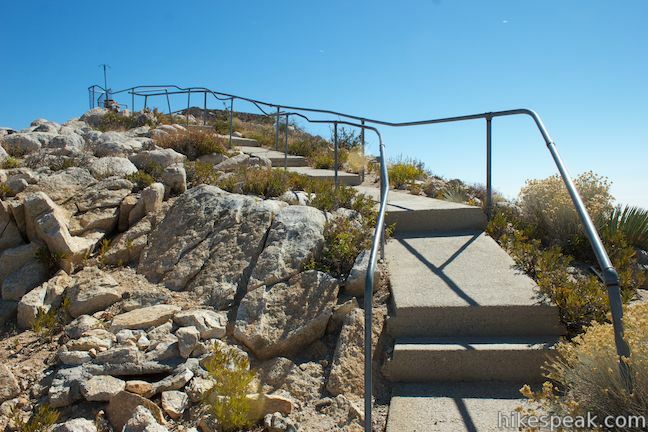 Once the trail is restored, hikers will be able to take it all the way to the top. 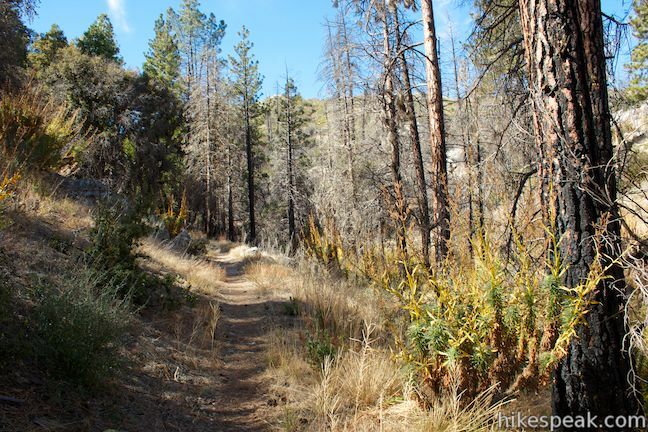 Until then, play it safe and turn left up Silver Moccasin Trail at the well-marked junction. The dirt single track weaves up the mountainside through a forest of coulter pines, incense cedars, and Douglas firs. 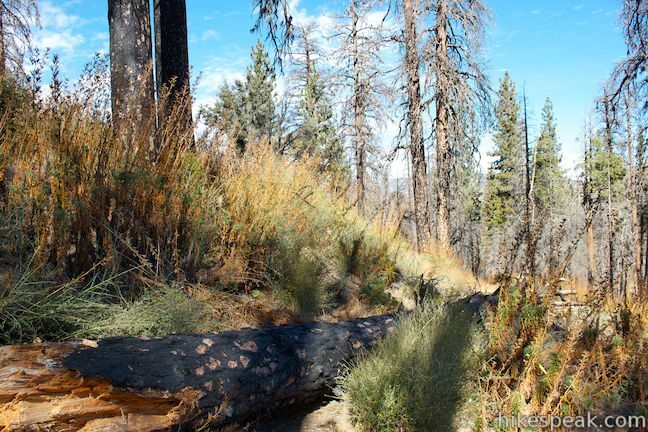 Some of the trees are burned and there are several downed and charred tree trunks along the trail. 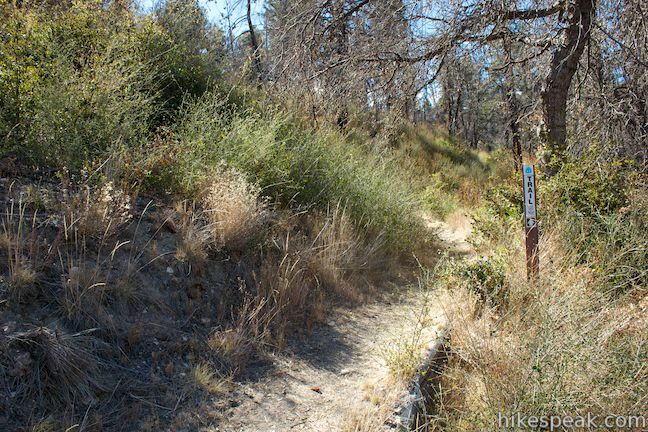 There are patches of poodle-dog bush along Silver Moccasin Trail as well, which you can avoid touching if you’re careful. After another 0.7 miles, or 0.8 miles from the start, you will come to a junction that is not as well marked. 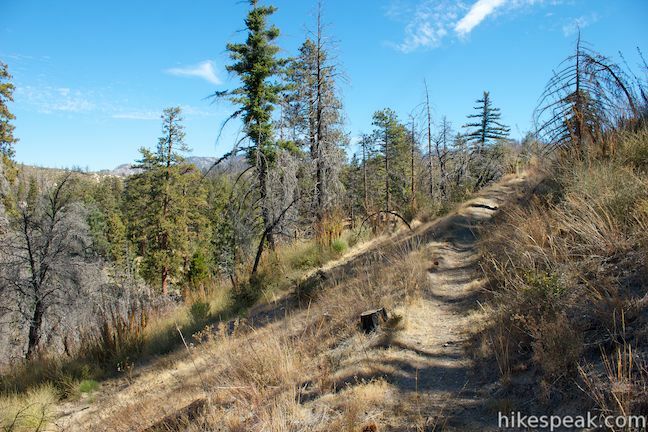 Instead of going up the trail to the left, turn right to stay on Silver Moccasin Trail and continue hiking up Vetter Mountain. 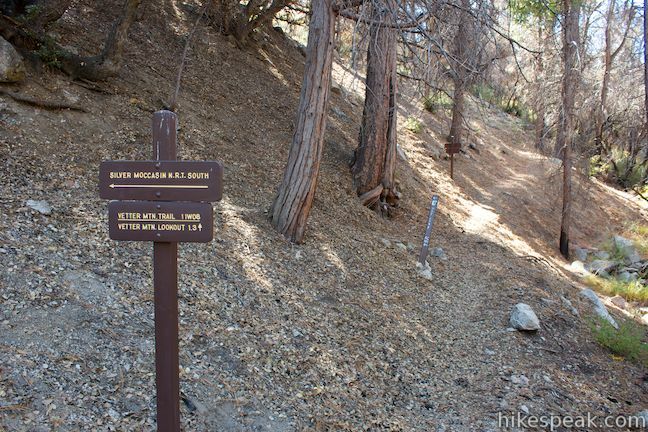 There is a smaller marker for Silver Moccasin Trail to follow. 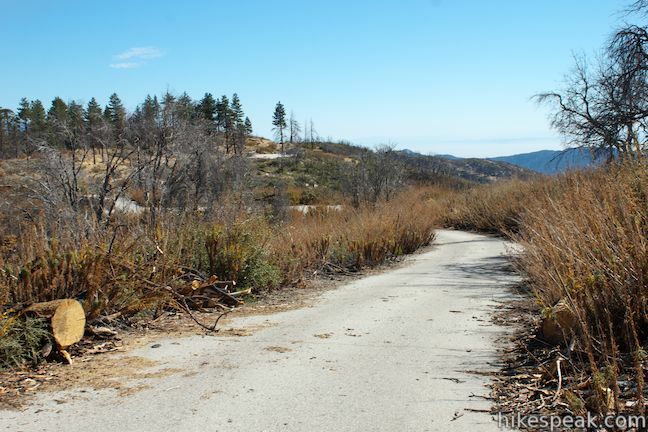 A tenth of a mile from the junction, Silver Moccasin Trail will cross a paved road. 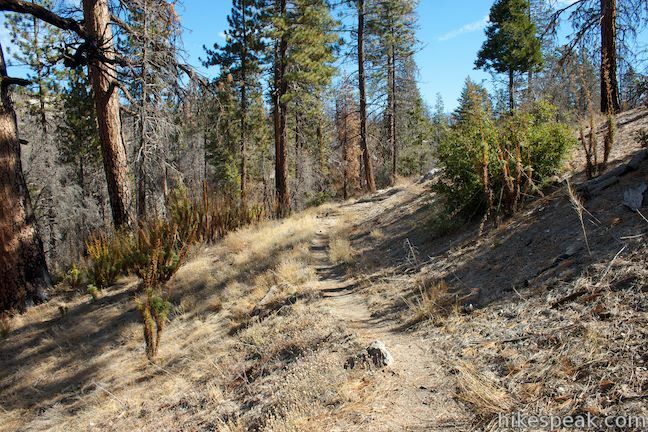 Proceed up Silver Moccasin Trail for another tenth of a mile until you strike pavement again, this time on Vetter Mountain Road. 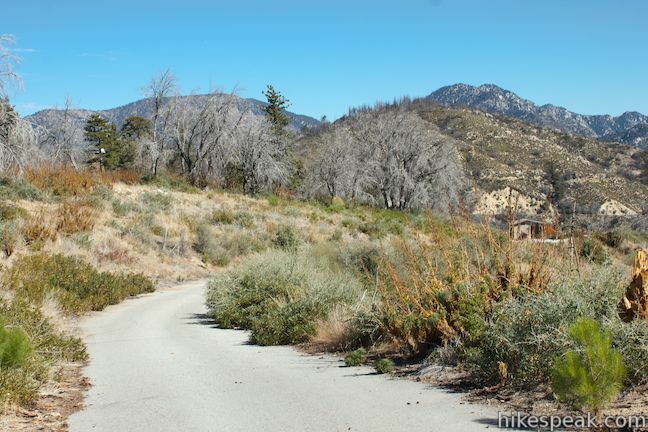 Leave Silver Moccasin Trail here and turn right up Vetter Mountain Road. 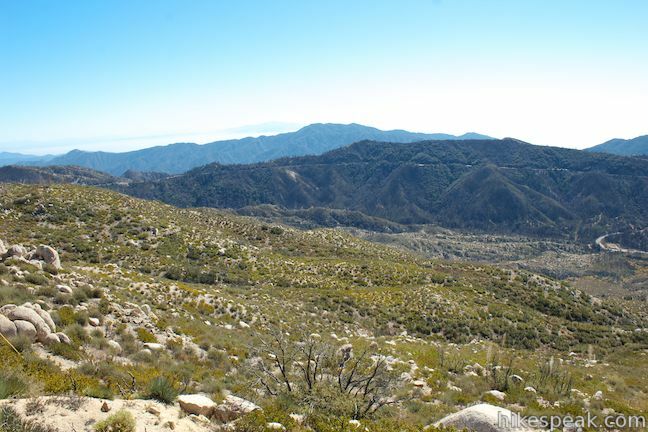 From here, it is 1.2 miles to the summit. Follow the directions above, remembering to stay to the left through the junction 0.7 miles from the summit where the road becomes unpaved. 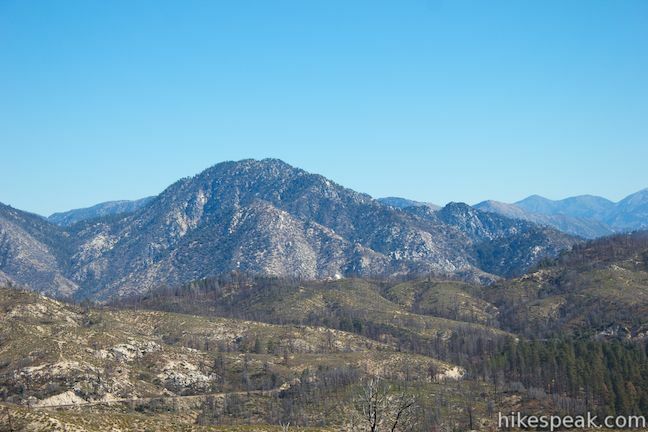 Hiking up and back on Silver Moccasin Trail and Vetter Mountain Trail offers a 4.4-mile hike with 650 feet of elevation gain (half a mile of which is paved each way). 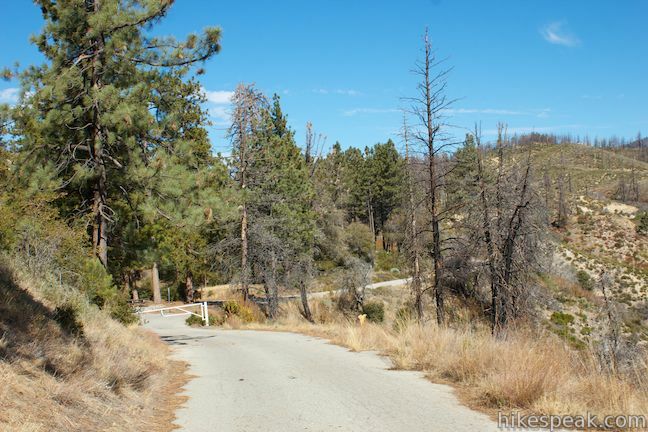 Hiking up and back just on Vetter Mountain Road is 3.8 miles round trip with 525 feet of elevation gain (1.2 miles of which is paved each way). 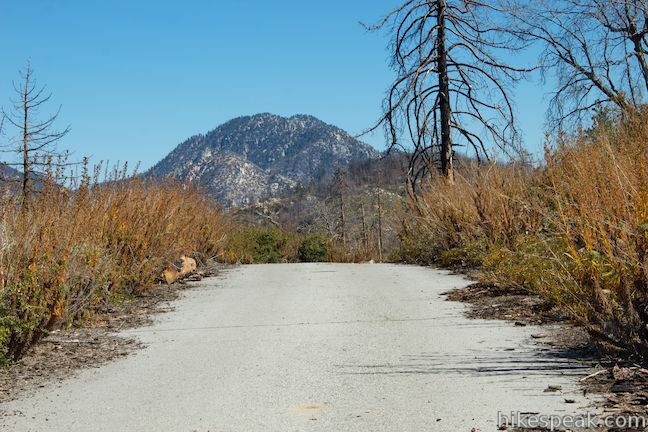 To make a 4.6-mile loop, you can connect the two routes by hiking half a mile on the paved road through the picnic area. Dogs and bikes are welcome on these routes to Vetter Mountain. 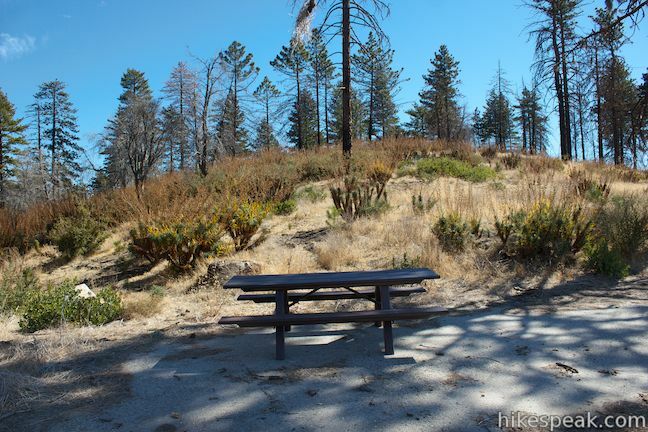 A National Forest Adventure Pass is required to park a vehicle in Charlton Flats Picnic Area, but no permit is required to hike to Vetter Mountain, so get out and enjoy! 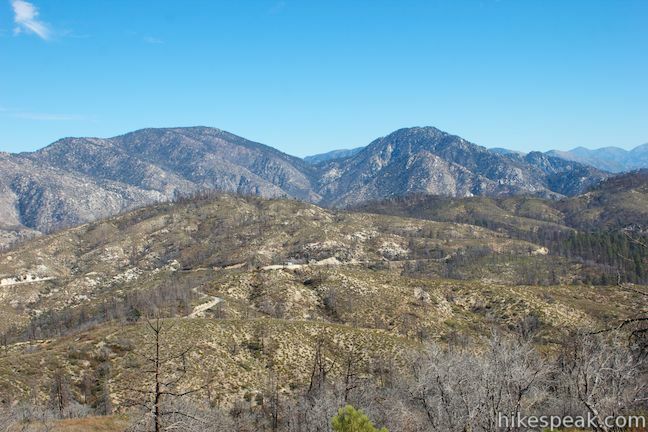 To get to the trailhead: From the 210 Freeway in La Cañada Flintridge, head northeast on Angeles Crest Highway (CA 2) for 23 miles to Charlton Flats Picnic Area. Turn left into the picnic area and drive a tenth of a mile to an intersection. 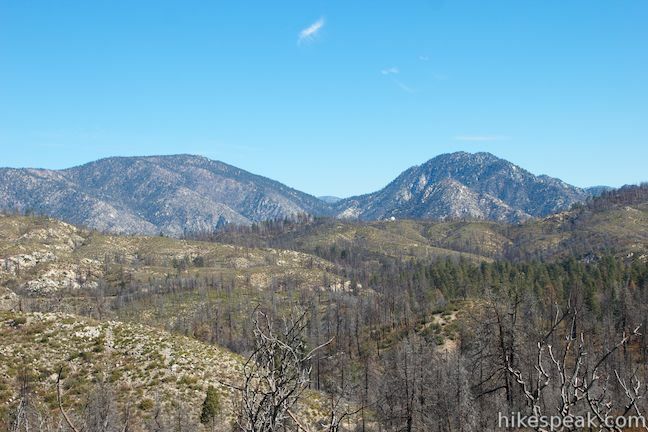 Continue another tenth of a mile to the left to reach Vetter Mountain Road or turn right and descend half a mile to reach Silver Moccasin Trail and Vetter Mountain Trail. These photos were taken in October of 2013. Click to enlarge. 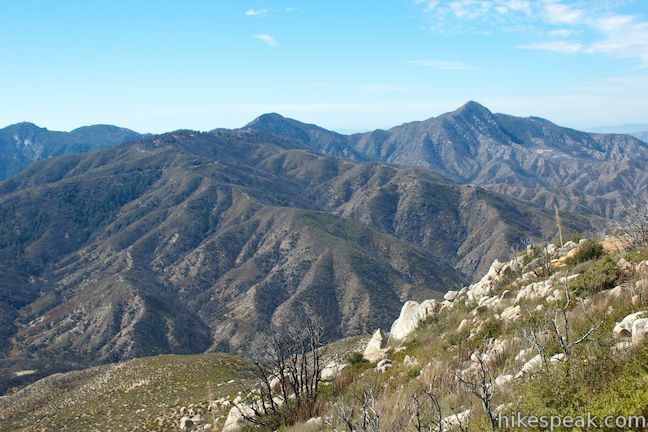 This 6,215-foot summit can be reach from two trailheads for a 3 to 6.25-mile hike gaining between 575 and 1,000 feet. 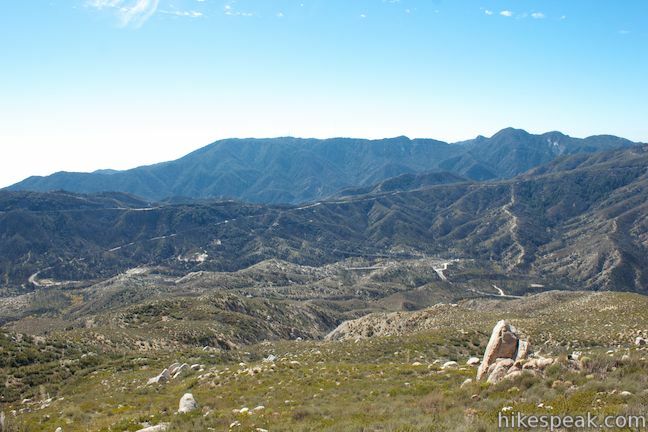 This 4.85-mile partial loop bags a summit and a scenic ridge in the high San Gabriel Mountains. 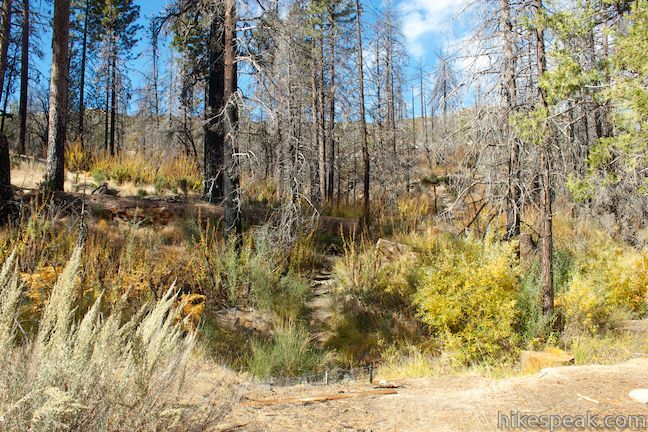 This 3-mile hike leaves from Buckhorn Campground and visits a short waterfall in an enchanting glen of tall pines. 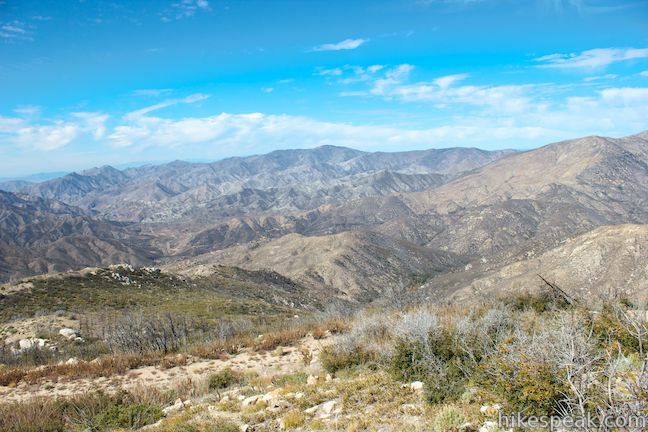 Explore other destinations in the San Gabriel Mountains, Santa Monica Mountains, and elsewhere. 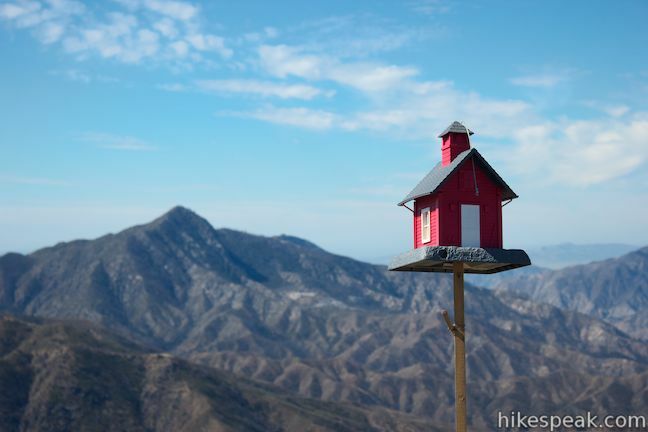 This single-site campground accommodates up to 50 people per night, offering fresh mountain air and sweeping views at 5,300 feet. 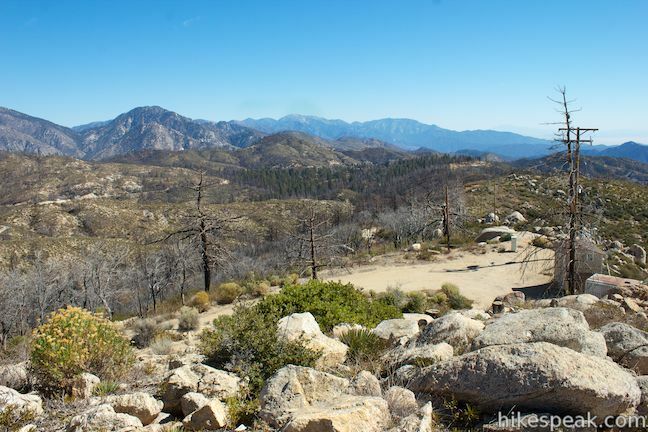 This 25-site campground in the Angeles National Forest in the San Gabriel Mountains offers first-come first-serve equestrian-friendly sites. 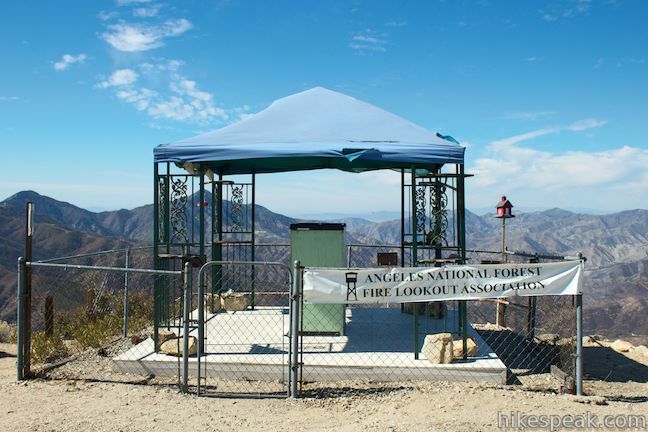 This 38-site campground is an hour drive up the Angeles Crest Highway from LA and a great weekend spot for summer tent camping. 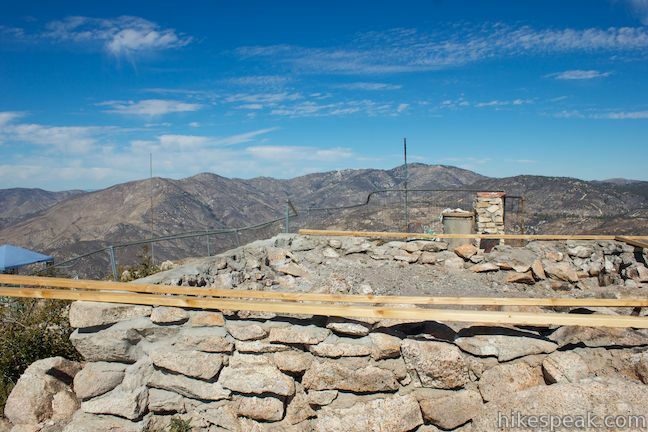 Vetter Lookout is being rebuilt! 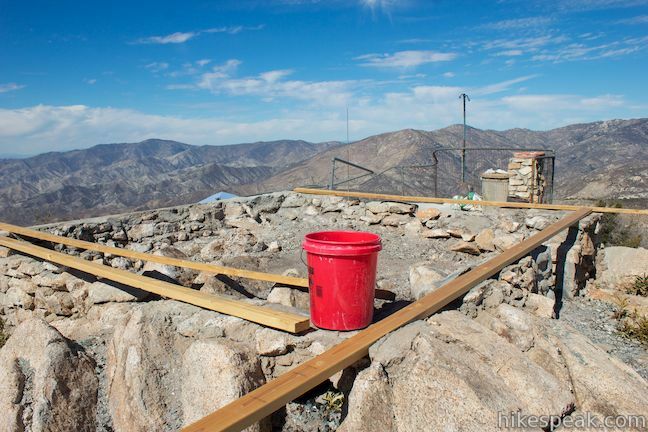 Yesterday, July 12 2014, volunteers from the Angeles National Forest Fire Lookout Association (ANFFLA) formed a literal “bucket brigade” to carry concrete up the steps to pour a new concrete cap in the original stone foundation. Once set, the new structure will be built, using original plans for the BC-3 cab as it looked in 1935. 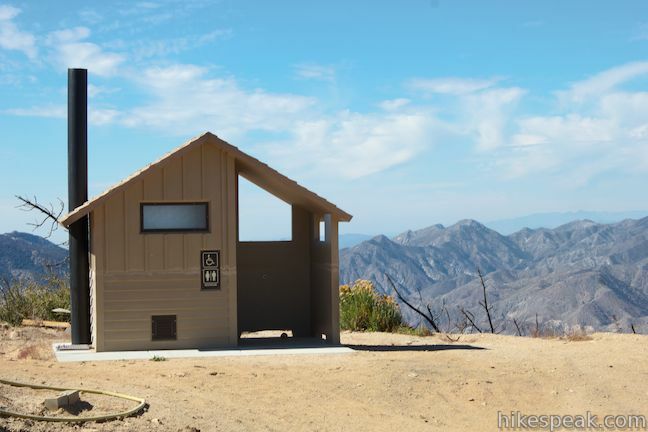 Like a Phoenix rising from the ashes five years later, Vetter will once again serve our fire lookouts and be a popular destination for hikers and other visitors to the forest. Awesome. Can’t wait to check it out! Last thing I heard is USFS Engineering Dept is procrastinating on design for last year. 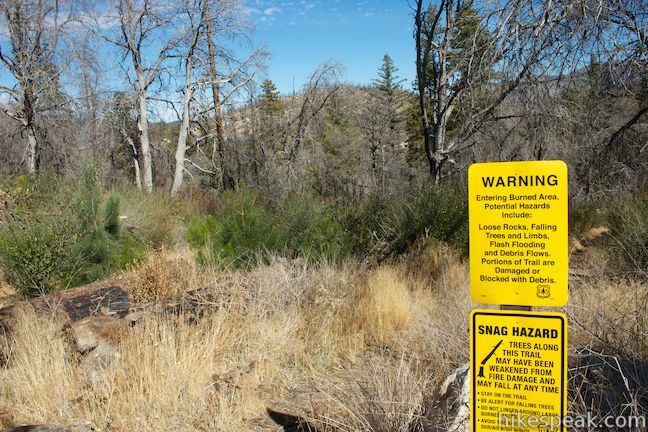 FYI, on the second route the ANF has posted trail closed signs where this trail intersects the road pass the Silver Moccasin Trail and where it comes out at the Vetter Mt. Lookout. We did the Vetter Mountain Trail to Vetter Mountain Peak on 12/10/17. 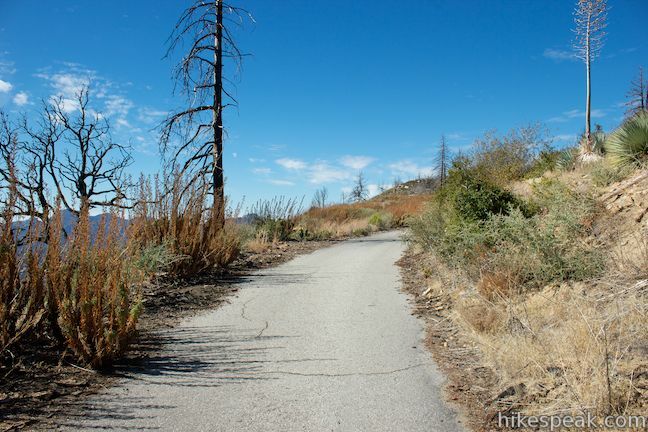 The trail has been recently trimmed, and many dead trees have been recently felled. 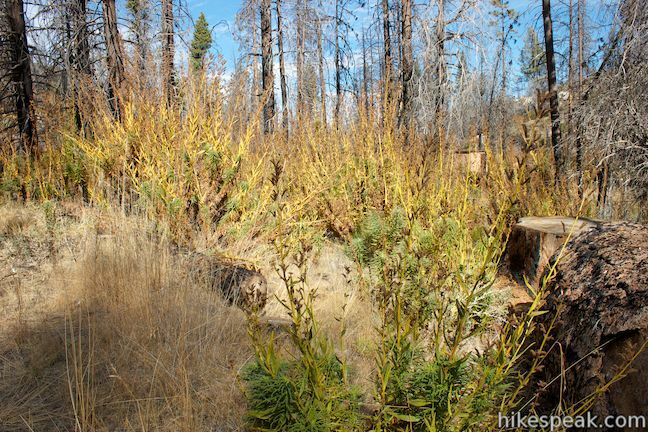 We saw the remains of poodle dog bush along the way, but the majority of it has been chopped back. I expect a lot of poodle dog will return in the spring, but for the winter you can get to the top via Vetter Mountain Trail without much hassle. 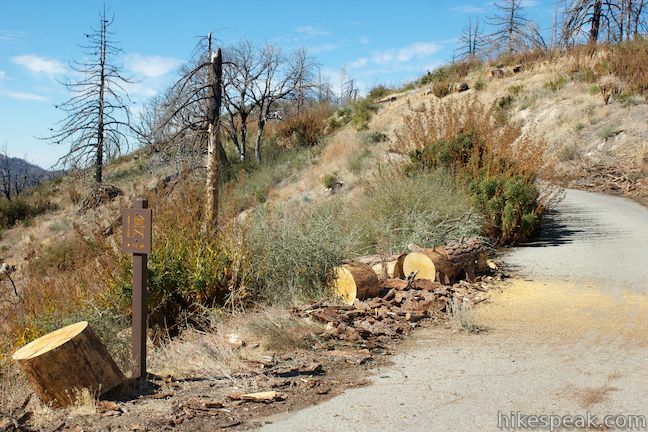 Thanks to the hard working trail crews who have returned this trail to use!